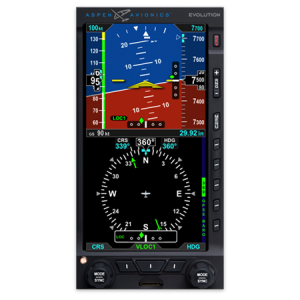 Aspen now shipping the Evolution E5 Electronic Flight Instrument | Avionics Blog – Avionics to the Max! REAL GLASS FOR UNDER $5K USD! The Evolution E5 consolidates attitude indicator plus DG/CDI into a single display with a rechargeable backup battery. It also includes Global Positioning System Steering (GPSS), air data computer, and attitude heading reference system (ADAHRS) for only $4,995 USD list price. This entry was posted in Avionics Upgrades and tagged ADAHRS, airplane, Aspen, attitude heading reference system, avionic system upgrades, Avionics, Canada, cockpit, efis, evolution 1000 Pro PFD, Evolution E5, glass cockpit, global positioning system steering, GPS, GPSS, Helicopter, inventory, Maxcraft Avionics, STC, tcas, TSO, VHF radios. Bookmark the permalink.